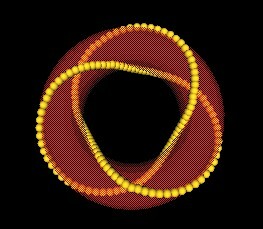 Recall the (2, 3) torus knot, which Lynnclaire Dennis calls the "Mereon Knot". 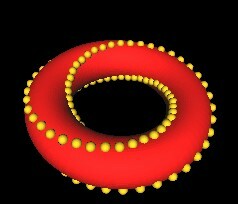 The knot goes around the torus surface 3 times while threading through the center torus hole 2 times. Is this the minimum knot that can be defined on a double torus? Here is the "simplest" Trefoil knot. It is a (3, 2) torus knot, meaning that the knot thread goes around the torus 2 times and threads through the torus hole 3 times. Consider a sphere. It has no hole through it. No Knot can be formed on the surface of a sphere (without crossing over itself) except for the trivial unknot (ring). Next, consider the sphere being dimpled and then a hole appears. This forms the simple torus. We consider the restriction Rule 1: Only one strand segment of a knot is allowed to pass through a hole. 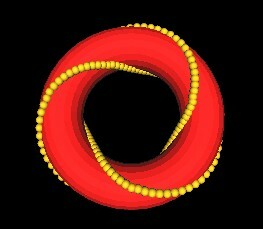 Applying this rule we find that we can only form the unknot with only the one hole of the torus. The knot is a simple ring. Next we introduce 2 holes through the original sphere to form the double torus. As shown above, the (2,3) knot, the "Mereon knot" is a knot which fits on this surface and which satisfies Rule 1 above. Aside from the unknot, is the (2, 3) knot the only one that can be formed on this surface with the restriction of Rule 1? Introducing 3 holes through the original sphere, and looking at knots which can be formed on the resulting 3-hole "torus", we find that the (3, 2) "simplest" Trefoil knot fits onto this surface. The (2, 3) Mereon knot and the unknot also fit this surface while satifying Rule 1. From the above consideration, it would appear that the (2, 3) Mereon knot is actually "simplier" than the (3, 2) Trefoil knot, requiring less holes through a sphere for its formation. The question to ask is then: Is there any physical reason to consider Rule #1 to be anything other than an arbitrary constraint?